The system settings window can be opened by pressing the button on the main panel. All default parameters are saved in the *.cfg file. The user-defined parameters can be either saved or loaded by using the buttons on the right hand side of the window. User can create so many configuration files as he needs. The <Save As...> button quits the window and saves the settings into the user-defined configuration file. The saved file becomes as current and the settings are applied for the current session. The <Load> button loads settings from the defined configuration file and make ones current. The file will be used for the next launching as default. The <OK> button quits this window with saving of settings into current configuration file and applies the settings for the current work session. The saved settings will be applied for next sessions too. The <Cancel> button quits this window and discards all the changes made. The <Apply for the session> button quits this window and applies the new parameters for the current work sessions only. 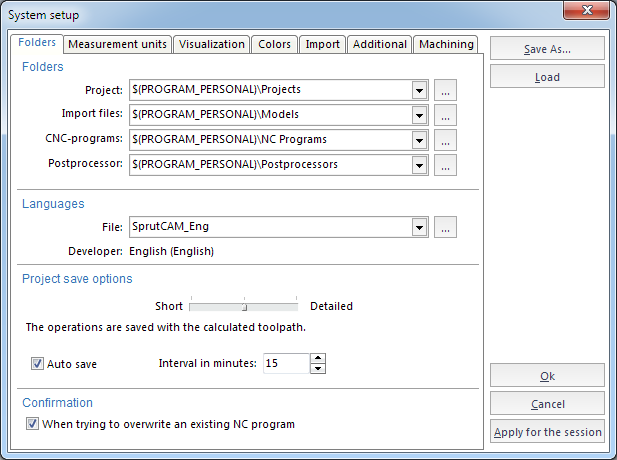 If, when launching SprutCAM, the current configuration file is missing, then a new configuration file will be created automatically, and all system settings will be reset to the initial values.